One of the main reasons there are so many people in favour of separate parliaments for Scotland, Wales, England and Northern Ireland is that England is dominating the UK so heavily. 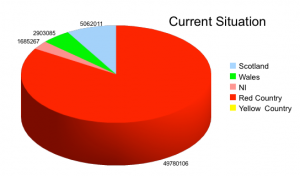 Just look at the pie chart on the right – England constituted 84% of the UK’s population in 2001. I therefore decided to investigate some ways of fixing the English problem by changing England’s borders. 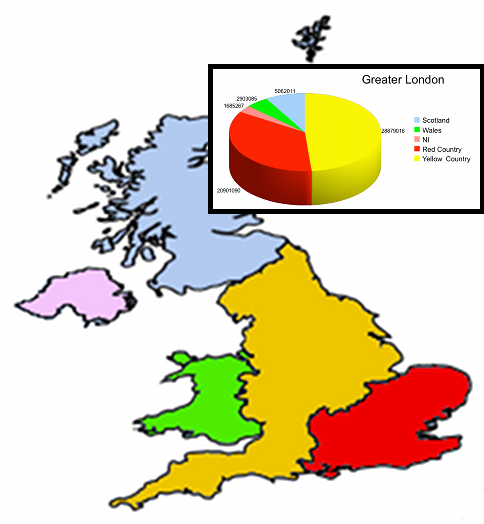 I’ve mainly used the English Regions for the following maps and figures. 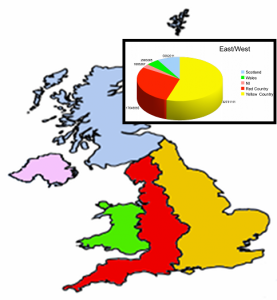 My first idea was to extend Scotland (adding Cumbria and the North-East) and Wales (adding Cornwall and the rest of the South-West), bringing both up to about eight million inhabitants. It’s nowhere near enough, though – England is still more than big enough to run the show undisturbed. To make this approach work, I guess Scotland would have to be extended all the way down to the Humber, and Wales would have to encompass the West Midlands, but that would completely undermine the Scottishness of Scotland and the Welshness of Wales. My second idea was to split England into East and West along a line extending down from the Pennines, but that isn’t enough, either: East England would be able to run the show on their own (but only just – moving a few counties such as Hampshire from East to West would take the East down under 50%). One might also argue that Cumbria is much more similar to Northumberland than to Somerset, so it might not be a very natural split. I also wonder whether London would dominate the East so strongly that the genuine needs of the peripheral areas would be completely overlooked. Another option would be to create a Greater London by merging London with the East and South East of England. This would actually work fairly well – although Greater London would be a lot less populous than the Rest of England, it would probably be able to hold its own given the way London dominates the whole of the UK. This might also be a very good way for the remainder of England to build up a identity separate from London, perhaps centred around Manchester or Birmingham. Finally, I tried to recreate the Danelaw. This would actually balance the two halves of England very neatly and would from a mathematical point of view be the best solution. However, it would place London on the border (just south of it, to be precise), and I’m not sure whether that’d be a good or a bad thing. From the point of view of Danelaw, its economy would be hugely influenced by London (and many people would be commuting from Danelaw into London), but it wouldn’t have any influence on over it. 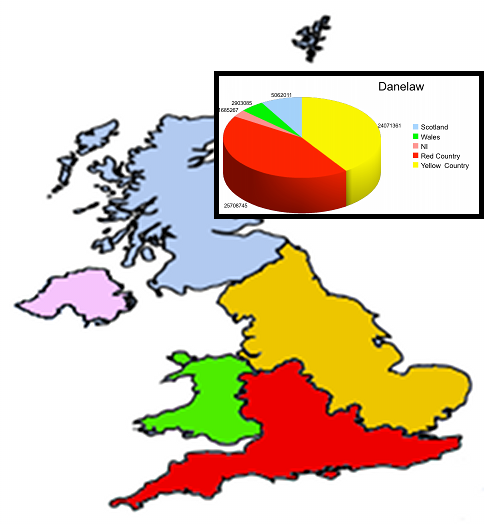 From the point of view of non-Danelaw England (Wessex? ), it would completely dominated by London, although it would be in periphery. THIS IS ATROCIOUS! It’s so bad it’s got me using caps. The ‘English Problem’???!!!! To be solved by either annexation or Balkanisation!!!!! The first idea … invading Cumbria and the North East … you’d have trouble with that one, those Geordies are a tough bunch. The Siege of Newcastle would be much, much worse than the Siege of Stalingrad. And what’s this about England ‘dominating’? The last Labour governments were overwhelmingly Scottish. If it wasn’t for Scotland, England would have a Tory government. Obviously I am no Tory (I am a social democrat) but it seems rather undemocratic that England doesn’t get the government it voted for because of legacy Scottish MPS whose role in a devolved UK is highly dubious. As you know, I am in favour of Scottish independence, which of course would solve the problem in a much more straightforward fashion. If we can’t have an independent Scotland, I’d prefer an English Parliament, which also would solve the problem to a great extent. This blog posting was just trying to present an alternative way of solving the issue, just in the same way as Prussia was split up because it dominated Germany too much. Corby, with its high Scottish population, would be a Kosovo-like problem potentially. Maybe Corby could be called Rebublika Sktska. I have an idea, why not make Scotland and Wales counties of England? Actually many people in Cornwall want home-rule for Kernow. We collected a petition of 50,000 signatures calling for a Cornish assembly but nothing so far. In fact the current government is threatening our territorial integrity. This is just ludicrous – and I take it with a grain of salt. Unfortunately, it will merely reinforce the stereotype of the devious Scots still trying to dominate England. Sad, sad, sad. Cornish Independence? – everytime self determination for England raises its head these people hi-jack the discussion. Whatever future Cornwall has under an English Parliament – it has absolutely NONE without one. Obviously this is not meant to be a serious article — it’s just a bit of fun — but I’m with at-Junius on this. I lived in Scotland for 12 happy years and loved the country from the first moment I set foot in Edinburgh. However, it can often be uncomfortable being English and living in Scotland — my country is seen as the oppressor, even though Scotland joined the Union in order to have access to a share of the action and profits in the growing English/British Empire. The historical memory of many Scots is selective, remembering battlefield defeats as historical insults but forgetting the huge economic and social benefits of union. 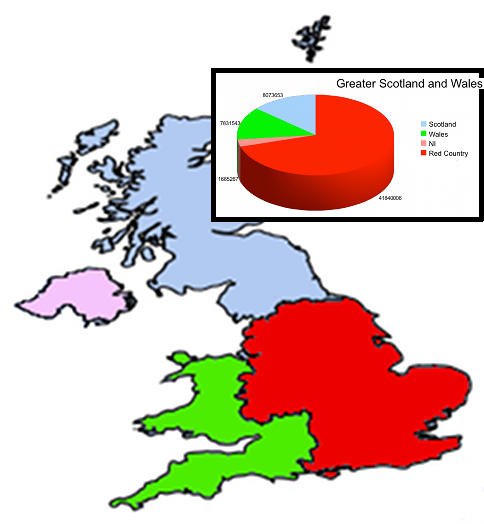 Now that the Empire now consists of a mere handful of remote islands, Scotland wants to be free of a union that no longer has value for them and which they see as dominated by England, even though proportionally speaking, Scots have more than their fair share of influence over the whole of the UK. The resentment that many English people across the political spectrum feel is real. It’s articulated by people like Billy Bragg (who is a socialist supporter of English independence), not just by right wing thugs. Scotland’s level of self-governance is seen to be increasing while England’s is diminishing, with what I call the ‘legacy’ Scottish MPs and the increasing power of the EU institutions. In my view, the only way forward is a divorce between Scotland and England as these resentments are only going to increase. PS I would be in favour of something more than a county council in Cornwall if the people there so desired! Having been to Cornwall briefly this summer, I definitely agree with Junius that Cornish independence seems to be a non-starter – Cornish self-rule within England, yes; full independence, no. Although it’s only anecdotal evidence, this was what I deduced from the number of times I saw the Cornish flag next the Union Jack. As for the more serious topic raised by Junius and Rob, I think you have to distinguish a few things. Firstly, if Scotland becomes independent, then of course the affairs of the remaining UK will have nothing to do with Scotland, and Scotland should keep out of it. Secondly, whether England wants/needs a devolved parliament is mainly a matter for England, but not fully so, because it has implications for Scotland. To me, one of the main issues with not having an English parliament is that in the UK government, there are secretaries for Education and Health and many other devolved areas; in effect, these people are only responsible for England, but because they’re part of a British government, they’re often seen as speaking for the entire UK (not least by the BBC and other media). It therefore becomes really hard to make the Scottish public understand what education and health policies are in Scotland. This problem would go away if England got a parliament, so it is in Scotland’s interest for England to lobby for this solution. At the present, England is dominating the UK in a way that can be very frustrating at time. It’s mainly small things: Cricket and the English national football team dominating TV and supermarkets at times; shops getting back-to-school stuff too late for Scottish schools (this is improving, though); kiddie TV starting and ending their summer holiday programmes two weeks too late, etc. This is mainly caused by England providing 85% of the population, which means that too many shops and media think it’s easier just to cater for the majority view. Just for the record, my preferences would be: (1) Scottish independence within the EU. (2) A proper federal system in the UK, including an English Parliament and a proper federal UK parliament. (3) Some other solution (such as splitting up England, although I agree it would have to be instigated by the English, not by the Danes or Scots). (4) The status quo. Finally, I obviously think all people should be treated with respect, no matter where they are and where they are from. If Scots (or Danes) can’t propose solutions for England (or vice versa), I think it will be political correctness gone mad, however; there is a big difference between proposing and imposing! Previous Previous post: Vale, Hans H. Ørberg!